We have two sets of display boards which members of the Surrey Association can borrow for their own promotional events. These 3-panel displays are 180 cm long and 90 cm high, plus an extra 25 cm for the central header board. The ideal position for the boards is on a long table. We have also created some display material to go with the boards which includes photographs, diagrams and text relevant to bells and bell ringing in Surrey. This material has been designed to appeal to all age groups and hopefully prompt questions and interest from the public. However, you can also personalise the displays with your own material about your ringers and the bells. How to borrow the boards? Just email Caroline Prescott (Northern District) or Sue Dixon (Southern District) to arrange a booking. 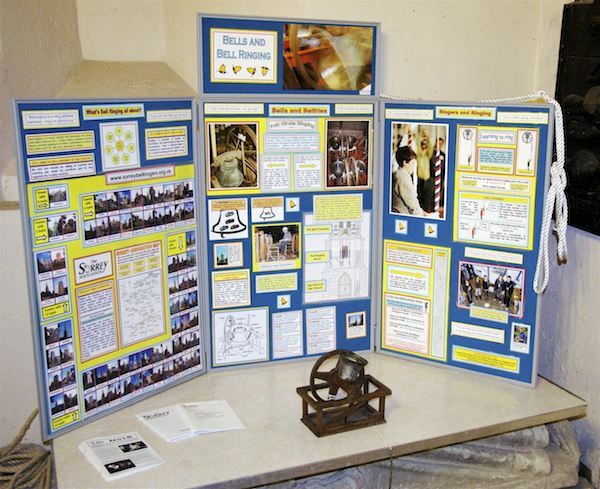 Display boards showing church bells and ringing is a great visual aid. If your church has a set of display boards that you can use, make use of it. Otherwise, good displays can also be done quite effectively by getting a large piece of card (A1 or A0 in size), a hanger and mounting your own material. Remember that the Surrey Association has boards which can be borrowed and which come with display material. When creating your own display material, try make it visually attractive with photographs of your ringers, the bells, bell ringing and notable peal boards. Text should be kept to a minimum and of large font size (16pt or larger). Don’t forget to mention details of practice nights and regular service ringing, your contact details, recent and historical notable events e.g. installation, re-hangs, special peals, Ring In 2000 and tower outings. Keep a pile of A4 folded handouts about bell ringing alongside the display boards to give out to people. Don’t forget to include the contact details of the tower captain / tower correspondent on these handouts. There are two excellent handouts you can use: the Surrey Association’s Guide to Church Bell Ringing can be downloaded in pdf format. A colourful leaflet produced by the Central Council can be also be downloaded from their website (click here) or free copies are available by post (click here). Other visual aids that often help to spark interest include a model bell, hand bells, a rope and sally, especially for decorative effect around your display stand.